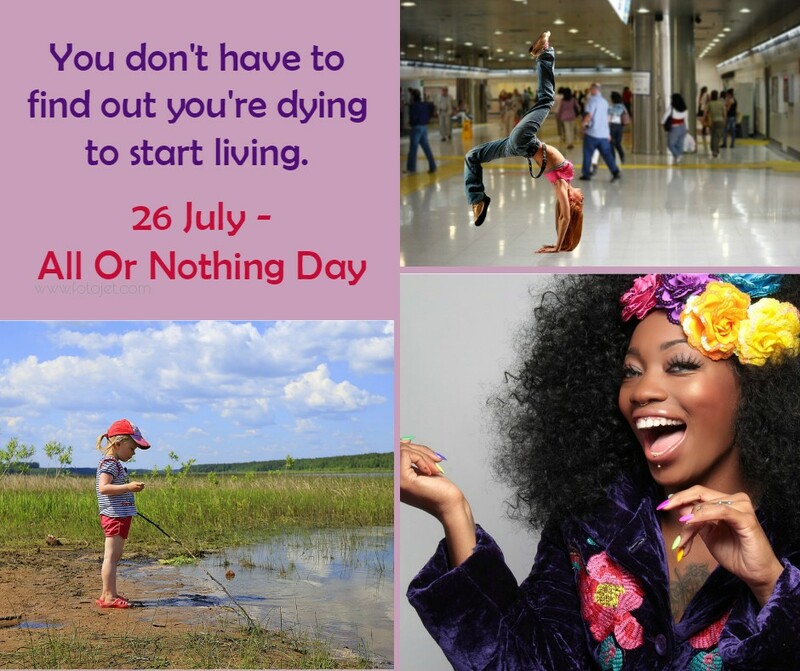 Did you know that today, 26 July, is All or Nothing Day? I found out about it only recently. Here’s the philosophy behind the day which certainly resonates with me. The Romans understood it so well they had a saying: “Carpe Diem” or seize the day. All Or Nothing Day takes that spirit and urges people to break through their barriers, ignore the fears that hold them back, and make that big commitment to a better life. Whether it’s applying for a job, trying an extreme sport, or just saying ‘sorry’ to someone, everyone has something they would love to do if only they weren’t so scared. All Or Nothing Day is the day for the girding of loins, taking it on the chin, and confronting those fears. As it says, by breaking the deadlock you may end up with all or nothing, but at least the barrier is broken. You succeed or fail, but are no longer paralysed by indecision. Heather Von St. James, 10-year mesothelioma survivor is giving her all or nothing to be an advocate for mesothelioma awareness. She makes sure her voice is counted among those who work for the banning of asbestos. Read more about her story and connect with her on Twitter. For your information Mesothelioma is a rare, aggressive form of cancer that develops in the lining of the lungs, abdomen, or heart. Caused by asbestos, mesothelioma has no known cure and has a very poor prognosis. What are you giving your energies to today? It makes so much sense, Corinne but we tend to forget, don’t we? Today I’m just trying to get through the day, working from home and taking care of M at the same time. This post is so inspiring especially that line by the 17 year old, I wish we all actually did that atleast a few days a month, if not week. When you read stories like these it puts some of our small worries into perspective. Of course we can’t all work towards our goals flat out every day but finding the time to do something that inspires us is hugely important. When people are prevented from doing something they love or that they are passionate about that is when they start to suffer from anxiety and depression. We need to nurture our souls! Great post Corinne. I have to tell you, the moment 3 teams of drs. told me that I wouldn’t be here in a year something in my mind automatically went to a similar place as your post. It was all or nothing in so many, many ways and as with everyone, I am a work in progress. You are correct. The list goes on and on.. I love Zach Sobiech’s quote, “You don’t have to find out you’re dying to start living.” Wise words from a young man. What an inspiring post, Corinne. We all have many things holding us back, taking that one step can be so hard. And yet its great to have someone cheering us on. Thank you… and much needed. Wow.. the quotes are very inspiring Corinne. If we try without being afraid of rejection or failure, we might win or lose but we already overcome our fear. Yes, I was inspired by it too, Rahul. Its my mom’s birthday today. So, for me its all about loving her.. Happy birthday to your Mom, Lata. Lovely sentiment too.